This year, the colour “yellow” is being featured, as exemplified by the Wattle flowers on our attached flyer. Adjacent to the hall, there will be a Quality Plant Market selling Mixed Garden Plants, Bromeliads, Gerberas, Orchids, Staghorns & Ferns, Sub-tropicals, Roses, Geraniums, Cottage Garden Plants, Begonias, Garden Novelties, Cacti & Succulents etc. This year we are trialling a twilight Quality Plant Market, from 5pm-9:00 pm on Friday 18th as well as the usual Saturday 8am-4pm and Sunday 9am-1pm plant markets. Each day and as needed, stalls will be replenished with quality plants. The Flower Show and a much expanded Photography Exhibition will also be opened on Friday, Saturday and Sunday at the times shown. $2 entry to the Spring Flower Show in the main hall and Photography exhibition in the hall foyer only. We welcome bus groups, and a discount to $12 is available for pre-booked groups of 10 or more. Book on 0448 714 561 or buderimgardenclub@gmail.com. Please book as early as you can, so that arrangements can be made for tickets to be sent. At the Craft Cottage adjacent to the Hall, Buderim’s artists, potters and sculptors will present their exhibitions including “The Sculptured Garden.” which features sculpture, along with unique planters, outdoor wall art, and functional and decorative pottery. Next door is St Mark's church which will be decorated with floral arrangements. Light refreshments will be available, with the Buderim Village Green across the road being an ideal place to wander and picnic. We have two local co-sponsors - the Manawee Garden Centre and the Buderim Bendigo Community Bank branch. Manawee Garden Centre is one of QLD's best nurseries, and is within walking distance from the Hall. The official opening is on Sat. 19th October at 2 pm. On Sunday 20th, the Monster Raffle will be drawn at 12.00 pm and the Festival will finish in the Hall at 1pm however Open Gardens close at 3pm. Festival details and the Show Schedule will be on the website www.buderimgardenclub.com in due course. The 2018 Garden Festival was a resounding success. The feedback we have received has been overwhelmingly positive, visitors all thought the gardens & flower show were great. We were fortunate this year to have had wonderful weather and great crowds (what a relief after all the rain the weekend before & most of the week leading up to the Festival). Organisation for the Festival started soon after last year’s AGM with the formation of the Festival Committee and with date claimers being sent out to all Garden Clubs. It takes a huge effort on the part of many to stage an event like the Garden Festival. My thanks go to the convenors who carried out their area of responsibility so effectively. This has been very much a team effort and I sincerely thank all the members of our management committee for their individual input and efforts as well as all the Club members who assisted with the setting up of the hall, manned stalls, assisted with buses traffic control, sat on Gardens, donated plants and entered exhibits to the competition. This year we were fortunate to have two sponsors. Manawee Garden Centre sponsored the club by covering the cost of producing the tickets for the Festival which this year came to $1125. They also supported the club by arranging an attractive floral display on the stage and we thank Manawee for their consistent and continued support. We also received sponsorship from the Buderim Bendigo Community Bank. The Bank sponsored most of the cost of the buses ($1500) which allowed people free travel to the open gardens. The cost of the buses came to $1920. We received much positive feedback for this free service. We are extremely grateful to the bank for their support of this community event. The club arranged a display of flowering and non-flowering plants at the OPO and Bendigo Bank for the last two weeks to promote the Festival, and I thank Steve Wikman and Jenni Campbell who readily helped setup & supplied their plants. Also, this year the BGC purchased 10 Festival flags, and they were well displayed around Buderim, and Teddy Gove provided 4 hanging baskets that were displayed at the hall. Thanks Teddy, they had great comments from the public. FINANCIALS (Summary, some items combined & floats/ticket sponsorship & Bus sponsorship left out, Lesley will have full breakdown of finances in her report). As always, it needs to be noted that it takes significant costs to stage an event like this. All the profits go to the beautification of Buderim and Buderim businesses benefit not only from our expenditure within Buderim but also from the extra customers that the Festival brings to the district. We have received excellent coverage in the media this year especially the print media. This was largely due to Noel Williams. Leanne Crowe provided great promotion to supply bus trips information on the Festival, and Monika used her many contacts to ensure the event was advertised widely with Garden Clubs of Queensland. Our Festival poster was on display in the Old Post Office for two weeks and at the Bendigo Community Bank for two weeks, as well as at the Qld Garden Expo. 5000 flyers were handed out at Nambour and the Buderim Street Party and various other locations such as local businesses and retirement centres in the months prior to the Festival. The display this year in the BWMCA Hall was once again splendid in its colour and the quality of the exhibits. This year we had 11 sections and 70 classes for members and non-members to enter. In total we had 577 entries in this year’s show. This compares with 480 in 2017 and 450 in 2016. One of the significant changes this year that accounted for the increased numbers was with the Children’s section. In 2017 we continued with inviting entries from the local pre-school however no entries were received. This year Milford Lodge Day-care Centre were enthusiastic to participate, so the Children’s Section was changed to two classes for children 0-3 and 4-5-year-olds. We had 80 great entries from the children at Milford Lodge based on the theme of a “Small World Potted Plant”. 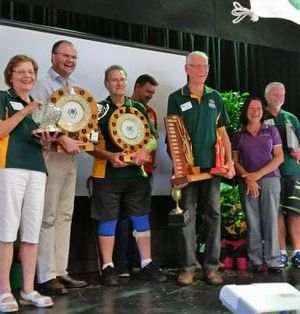 The official opening of the Show and presentation of trophies was again held at 2pm on the Saturday and BGC invited Marjorie Van Roy, our patron and sponsor, Peter Macdonnell from Buderim Bendigo Community Bank and the Federal Member for Fairfax Mr Ted O’Brien to present the trophies to the winners of the various sections. Our Chief Steward and Convenor John Sargaison has once again done a wonderful job. Thank you, John. The 2018 BGC Garden Festival featured 6 Open Gardens. The Open Gardens where selected to showcase the diversity in size and style of gardening in our area. It was very pleasing to have 2 of the 6 gardens from Club Members this year, and it was great to have 4 non-members offer their gardens as open gardens to the BGC, a great effort on behalf of our Club and the Members/Owners. The club donated $300 to each garden owner to help in preparing a colourful display, which was most appreciated by the owners. This year we had 1 x 28 and 1 x 24-seater bus on Saturday and 1 x 28 on Sunday making a total of 8 trips on Saturday & 4 trips on Sunday to all the Open Gardens from the Memorial Hall. 284 people used this free service, and were very happy with the opportunity to enjoy some of Buderim’s beauty. This was free to ticket holders with thanks to the sponsorship this year from Buderim Community Bank branch of Bendigo Bank. I would like to thank Peter and Laurel Asimus who controlled the mini buses visits to gardens (well used). Again, this year the BGC in conjunction with Sunshine Coast Council (SCC) had Temporary Bus Zones for open gardens. The SCC arranged the installation of temporary Bus Zones. These signs were placed as set by SCC on Friday before & taken down on Monday after. 5 Garden Clubs attended the Festival, using presale tickets and 5 Buses – 113 visitors in total (last year 290, which saved us with Big Wet). The BGC arranged preselling of tickets from the Buderim OPO, Manawee Garden Centre, Buderim News and Buderim Community Bank prior to the Festival, with some sales at Manawee over the Festival weekend, and we thank those outlets for their help. Complimentary tickets, discounted tickets ($12) to Garden Groups bus trips and $15 ticket sales, totalled just over 800 tickets in total, not forgetting the return from $2 coin donations for Hall entry. $15 tickets were available at all Open Gardens with a $5 entry to a single garden. Once again, the Buderim Scout Group did a wonderful job catering for us at the Festival. Everything ran smoothly and the cakes, scones, quiches, pies and sandwiches were enjoyed by many, Great food and great service. The lawn area between the Hall and the Cottage housed about 20 stalls, BGC was very pleased with the location/quality of the different stalls and the general flow of people traffic, thanks to Robin Porter for arranging this. All stall holders were very pleased with their location and sales. All expressed interest in returning next year. The Club receives 10% of their takings and this year we made $? from the stalls. Special thanks to Vonnie Young for arranging the stall holders that attended this year. Our Club plant stall did exceedingly well and we thank all who donated plants. We raised $2,336.00 on this stall and this is surely due to Shirley McDonald and her team, many thanks. An art exhibition in the entry foyer, organised by Sarah Seeberg proved to be very popular. The artwork by local artists showed we have here in Buderim some very talented people and it is hoped they will be part of the 2019 Festival and once again display their works. Thank you, Sarah. As in the past the Potters of the Craft Cottage ran their sculpture Garden Exhibition in conjunction with our Festival, and St Marks Church had a great floral art display. The BGC thanks them for their contribution to our Festival. I would like to thank all members of the Club who volunteered their time by sitting on gardens, working on the plant stall, selling raffle tickets and Open Garden Tickets, helping to set up for the flower show, and take it down again. Thanks to Laurel Asimus and the ladies who made sandwiches and sausage rolls for Friday morning breakfast. I would like to give a special thank you to Peter Asimus for working tirelessly organising the passengers for the buses. I would like to thank the Convenors, all of whom did a great job in their area of responsibility and who made my task much easier. I would like to thank everyone on the committee for the role they played in making this Festival the success it was, especially treasurer Lesley who had lots of money & finances to deal with. I must thank Kathy my wife for great cleaning of hall during festival and putting up with me and all the time I spend on the festival organisation. Lastly, I must thank Caryll Beck for organising & catering the post festival drinks and feedback session. For the week prior to the show Buderim and surrounds received much needed rain for which we should be thankful. However from the Flower Show perspective the duration and quantity of rain received did have an impact on the quantity and quality of entries received and in particular with the cut flower sections. 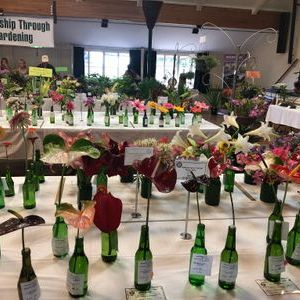 Despite this, members still found sufficient entries to provide a wonderful floral display in the hall that the show judges and members of the public endorsed. The Friday show set-up commenced at around 7am with an army of enthusiastic members fronting up and within 1.5 hours the hall was ready to accept entries. It was a pleasure to watch the transformation with such a great team in action. The set-up was followed by a lovely breakfast for those present that was provided by Laurel and her team. It is touches such as this which make the week-end such an enjoyable experience to be involved in. Entries were accepted from 9:00am and by 12:00pm the hall was looking and smelling wonderful. The judges arrived around 12:00pm and were taken to Ann Colville’s residence for a lovely lunch that was thoroughly enjoyed by all in attendance. Judging commenced at 2:00pm and was completed by 4:30pm. This year we had 11 sections and 70 classes for members and non-members to enter in. In total we had 577 entries in this year’s show. This compares with 480 in 2017 and 450 in 2016. One of the significant changes this year that accounted for the increased numbers was with the Children’s section. In 2017 we continued with inviting entries from the local pre-school however no entries were received. This year Milford Lodge Daycare Centre were enthusiastic to participate, so the Children’ Section was changed to two classes for children 0-3 and 4-5 year old. We had 80 great entries from the children at Milford Lodge based on the theme of a “Small World Potted Plant”. The judging of the two classes proved very difficult due to the imagination and efforts of the children. The children’s entries were staged at Milford Lodge that freed up some space inside the War Memorial Hall. Entry Slips not being correctly filled in - suggested improvements being changed layout of entry slip and training of preparation assistants / stewards. Over the week-end our volunteers maintained the show exhibits in a great condition for the benefit of our visitors. Some members even went to the effort of bringing in fresh flowers on Saturday and Sunday to replace the wilting flowers staged on Friday. It was very pleasing to hear the many positive comments from our visitors who were suitably impressed with the size and quality of our Show. This is something that our club should be justly proud of. The official opening of the Show and presentation of trophies was again held at 2pm on Saturday and there were a number of visitors and members present in the hall to witness this. The Federal Member for Fairfax Mr Ted O’Brien, Marjorie Van Roy (Manawee Plant Nursery) our patron and major sponsor, and Peter McDonnell (Buderim Bendigo Community Bank) our other major sponsor conducted the opening and presentations. The show closure and dismantle again went off extremely well due to the great turn out of volunteers. The heavens were kind to us and just as we finished the bulk of the work the skies opened up with a heavy downpour. To run a successful show of this size involves many activities and in turn these activities working seamlessly together to produce a great outcome. Some activities are straight forward and/or don’t have critical time paths and others are more complicated and have tight time constraints. One of the more complicated activities which also comes with tight time constraints is the preparation of the first/second place and champion certificates which you see on the hall tables when the Show opens on Saturday morning, and working out the trophy winners. One person does this and I would like to acknowledge Monika Stinton who worked until after midnight on Friday night to complete this task. There are many other people that I would like to single out for special mention, however for fear of missing someone out I will not – you know who you are and if I have not yet personally thanked you for you valued efforts please accept my sincere thanks. In conclusion I would like to sincerely thank again the army of volunteers that assisted in any way with the running of what was a very successful 2018 Flower Show. 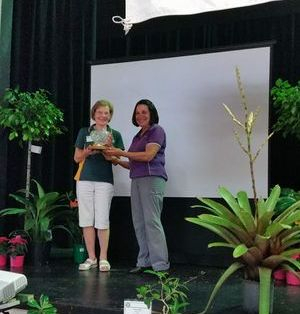 Section Winners at Buderim Garden festival held on October 20th & 21st 2018 . There were 70 classes in the Schedule, and despite the 2 weeks of rain prior to the Festival, there were 577 entries - a commendable effort. There were record numbers of entries in 2 Sections - the decorated Shoe and the Children's Small World Gardens. Ken Evans won the most prizes throughout the Sections - he also won this last year! Congratulations to all winners and competitors. Every care will be taken of exhibits however the Buderim Garden Club will accept no responsibility for damage to or loss of exhibits. A maximum of 3 entries per exhibitor in each class. All exhibits in Sections 1-7 and 9 must be the property of and have been grown by the exhibitor for at least 3 months prior to entry. Exhibitors in Sections 1-4 must use containers provided by the Buderim Garden Club. The stem of exhibits in Sections 1-4 must be clearly visible at the neck of the container. Exhibits in Sections 1-4 may be wedged at the neck of the container, with plastic tubing, but staking of the stem above the container is not permitted. It is better to insert the stem between the container and plastic tubing rather than the middle of the plastic tubing. Special arrangements will be approved for supporting flowers of climbers / vines (Sections 2/26 and 3/28). Exhibits in Sections 6 and 7 must only be shown in the pots / containers / baskets that they have been growing in, without any additional display container or covering. In Section 11, the exhibitor must have taken the photograph. Photographs should be 200 x 150mm. Photos remain the property of the exhibitor. Exhibitors in all Sections are responsible for the arrangement of their exhibits before entering them. Only Stewards and Judges will be allowed to touch/move entries once staged in the hall. No person other than the Judges and Stewards are to be present during judging. Prizes may be awarded in each class at the discretion of the Judges (1st = $10, 2nd = $5). The judge’s decision will be final. Prize money may be collected from the Show Secretary any time after 12:00 noon on the Saturday. Hours of entry acceptance will be strictly adhered to. All exhibits must be staged by 2:00pm on Friday when the hall will be closed for judging. No exhibit is to be removed from the show benches before 3:15pm on the Sunday. Open Design with plant and/or flowers* (base no larger than 30cm square and be able to sit on the display table).